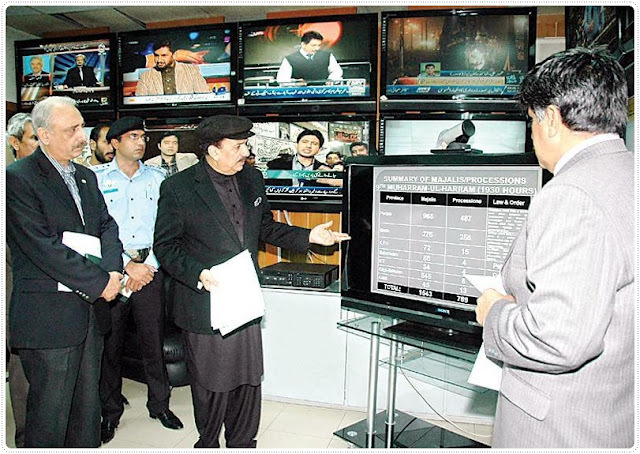 Federal Minister Rehman Malik on Satarday (November-24-2012) visited the National Crisis Management Cell (NCMC) in Islamabad and reviewed security arrangements made for Muharram all over the country. During his visit at NCMC, the minister directed the concerned authorities to ensure foolproof security including aerial surveillance of mourning processions. He said that ministry of Interior and National Crises Management Cell (NCMC) will remain open 24 hours to monitor the law and order and security situation throughout the country. He also reviewed the system of coordination between center and provinces, set up in the Cell. NCMC is a part of Ministry of Interior, Pakistan Secretariat Islamabad.